This species is included because it is sometimes encountered associated with termite mounds to the west of Cairns. 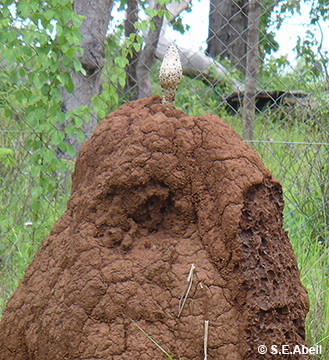 The fruiting body grows out of the top of Nasutitermes sp., termite mounds, the stem extends into the mound for up to 20 cm utilizing grass stored there. The fruiting body at maturity may be up to 35 cm long and to 10 cm diameter, whitish, with darker scales, splits to release black powdery spores. Stem to 8 cm long, thick to 5 cm diameter.